In the face of persistent criticisms of the Guyana-ExxonMobil agreement, Business Minister Dominic Gaskin on Tuesday railed against critics who see the deal as “chicken feed”, instead saying that it would yearly earn the country more than gold. 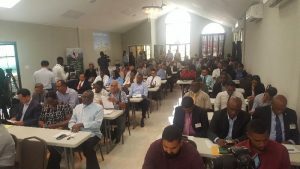 Addressing the opening of a Private Sector Commission- organised seminar under the theme “Oil and Gas in Guyana: Perspectives in Guyana”, Gaskin said he had no problem with criticisms of the contract but contended that comparisons with Ghana and Uganda amounted to “incomplete and misleading” information. Noting that ExxonMobil was not compelled to renegotiate the valid 1999 agreement with Guyana, the Business Minister said the 2016 “revised” Production Sharing Agreement which provides for a two percent royalty and 50 percent of profit oil would earn the country a minimum of US$300 million annually from 100 barrels of oil per day at today’s estimated US$60 per day. That, he said, would be much more than the US$300 million in taxes and royalties that Guyana has earned from gold in eight years. “The last eight years have been the best years ever for gold production in Guyana both in terms of the amount of gold produced and the value of gold produced and exported and also the value of royalties and taxes collected by government,” Gaskin said. Yet I’ve not heard anyone complain about Government’s share of gold revenues, and our gold is valuable, non-renewable natural resource just like our oil,” he said. He noted that by 2022 when the second phase of development starts to produce oil Government revenues would increase to approximately US$800M per year. “So for anyone to assert that our government is selling out and giving away our oil is just plain nonsense” he said. With regards to future oil blocks, the Business Minister said an international firm would be hired to ensure Guyana gets a good deal. “I also believe that we are now in a much stronger position to negotiate the remaining blocks based on Guyana’s national priorities. The interest is there and many of the world’s leading international petroleum exploration companies want a piece of the action. And when it comes to allocating the remaining areas government will be hiring a firm with international expertise to guide that process. Because we now have options. There is a demand for our petroleum blocks” Gaskin added. “My views transcend politics and this is why I don’t blame the previous government for the terms and conditions of the contract they negotiated. In the context of an offshore basin that had not yet been de-risked it may not have been prudent to demand more”, he said. The Business Minister cautioned that demanding more could have scared away investors. Oil production offshore Guyana is expected to begin in 2020. With more discoveries, latest estimates are that Guyana’s production will be 500,000 barrels per day.